Create a grid 20X10 yards. Mark the halfway with a line of cones about 5 yards apart. Split into groups of three players. A group of three players needs two balls. 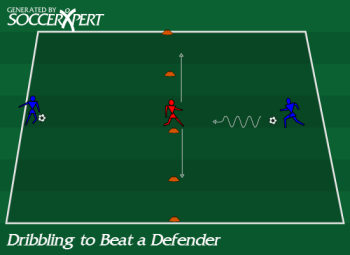 Position the defender in the middle line in the grid. The defender in the middle is restricted to only move side to side on the middle line in an attempt to stop the dribbling attacker. Instruct the attacker to approach the defender under control, make his move after making the defender commit, and accelerate to the other side of the grid. If the defender wins the ball, he switches role with the player that lost the ball. Focus on a controlled approach by the attacker. Sell the fake/faint to the defender. Make sure the dribbling players change direction. Make sure the player accelerates to the other end line once past the defender.